Bastak branded Roller Mill 4500-s model, double passaged air circulated labratory type roller semolina mills. The deviece is dumpened wheat mill but on will can be used on grinding both dumpened and undumpened wheat. The deviece consists 2 sections as crushing and grindingin crushing section, the wheat is milled by go through mills and coarse semolina and bran in collecter container undersifting part can be separated. On sifting part 850 micron sieve is being used. In the grinding section, coarse semolina taking from crushing section can be separated as; flour, fine and coarse semolina. In this section sequentially 160 micron and 280 micronsieves are being used. In crushing section there are 3 valces and in grinding section there are 3 valces in total 6 valces are being used. In front of the deviece there are sifting sections. In liso part under sifting section there is 1, in grinding section there is 2 in total 3 collector continer is being used. In sieving section the lenght of sieve is between 340-360 mm . In order to activate the liso part there is 1-0-2 switch button and to activate sieving section there is 0-1 switch button being used. On request liso can run in opposite direction thus the sieve is emptied completely and after switching to other direction can do grinding. 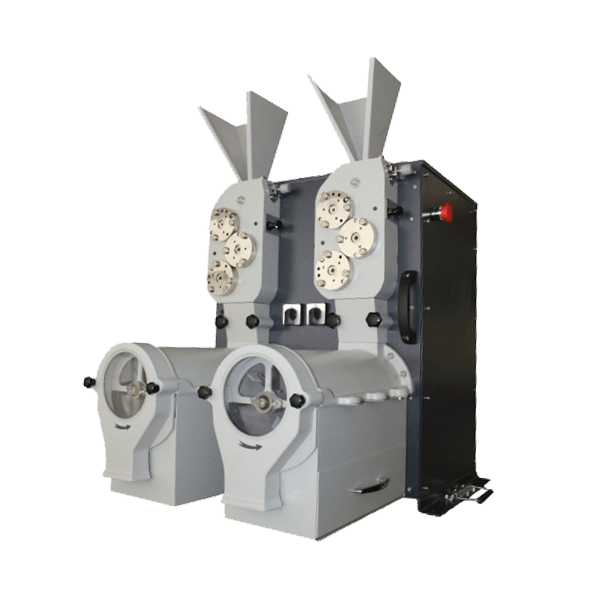 The deviece has the capacity of grinding at 100gr/minute. The flour efficency can be up to %40-%70 depending on the wheat quality. The outside dimensions of the device are 700x700x900 mm and its weight is 110kgs. The device operates at 380V, 50Hz.